Hi everyone! 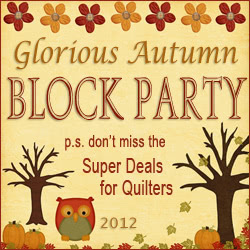 Welcome to Block 37 of our Glorious Autumn Block Party. 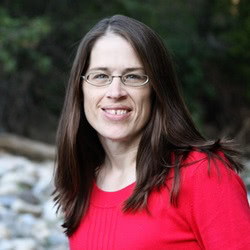 Today we have Konda Luckau as our featured designer. I learned how to sew in 4-H and Home Ec. My mother was a PE teacher with an aversion to sewing. She did own a sewing machine that I was able to use and experiment with. When I was in high school, I heard that you made a quilt by sewing squares into rows and sewed the rows together. How hard could that be! My mother dug out some Hawaiian fabric that she had once thought to make into a quilt. She had a few squares cut out. I finished cutting squares – with scissors and not much sense of accuracy – and made rows of squares. When I laid out the strips, I realized that my squares would not match up. In a desperate attempt to salvage my work, I rotated the rows so it didn’t look like they were suppose to line up. I still love this quilt! It is really hard for me to make a quilt exactly like the pattern is written – even if it’s my pattern! I always like switching things up a bit. It was charm packs that caused me to make the jump to a designer. When charm packs were first entering the market, my local guild was having a brown bag challenge with 5″ squares. At first I didn’t know what to do with the squares. There were only a handful of patterns available. Then I started playing with ideas. I ended up with a dozen ideas that I showed the guild. One of the guild members took them to our local quilt shop. The shop owner suggested that I write up the patterns for her to sell at her shop. It was a light bulb moment for me when I realized that someone might want to purchase my ideas. 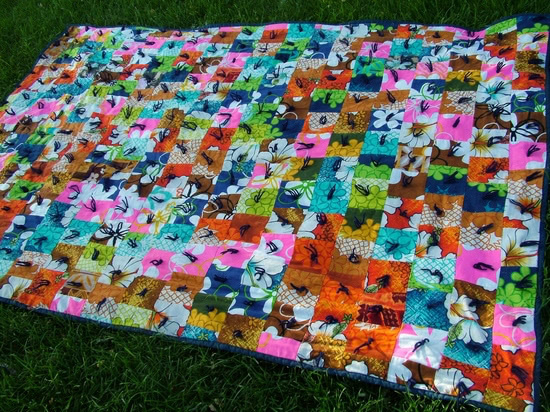 “Simply Twisted” is one of my favorite quilts. It is the first one I designed using a charm pack and is in my book Simply Charming Collection. It is a simple block that forms an interesting secondary pattern because of the way the light and dark fabrics are alternated. 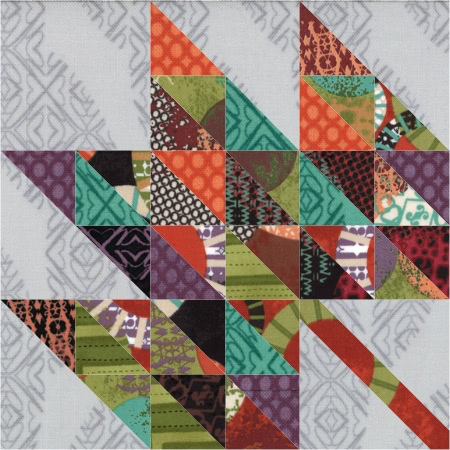 I fell in love with charm packs with this quilt because I never would have been able to choose the fabrics and colors of this quilt on my own. The fabric is Moda’s Chocolat Wovens. It has a soft Heather backing fabric. The drape of this quilt is fabulous. It just asks to be cuddled. It’s the perfect throw quilt! How many UFOs do you currently have? I have no idea. I would count them, but along the way I would start another project. What size of quilt do you prefer to make/design? I love throw quilts. I love reading with a small child and a quilt on my lap. It’s my favorite size of quilt. Favourite one-sentence tip for a new quilter: Have fun and just do it! Here’s Konda’s block: Autumn Glory Leaf Block. 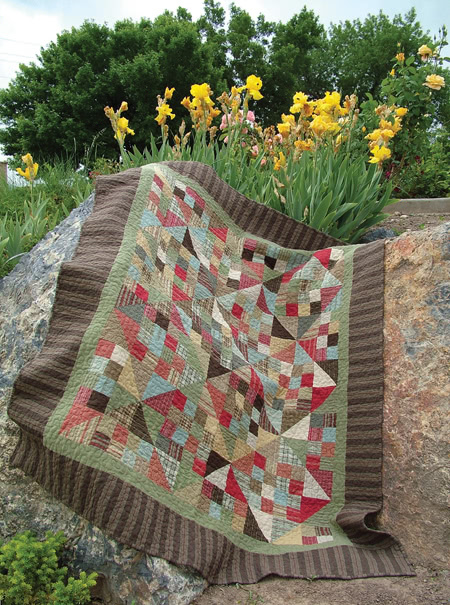 It’s an excellent block for using up your scraps. Head over to Konda’s blog to download the tutorial. Konda is giving away a copy of her book Simply Charming Minis. Need a last minute Christmas gift? Try a mini quilt! 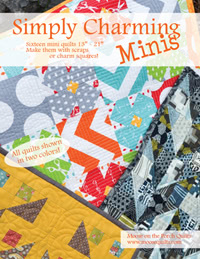 Simply Charming Minis has 16 patterns from 13″ to 21″ all shown in two colors. Mini quilts are so fun you’ll be done before you know you started! Visit Konda’s blog to enter the give-away. I love Kona’s block and her Mini Quilt book is excellent! I would love to win it. It is worth a look everyone! I looked at it at the library! I also followed along on the blog hop when it came out!